"The allegation of "Fake" Joho academic papers have a huge impact on Jubilee votes at the Coast." says Mutahi Ngunyi. - Bana Kenya News, Real African Network Tubanane. Home Editorial "The allegation of "Fake" Joho academic papers have a huge impact on Jubilee votes at the Coast." says Mutahi Ngunyi. "The allegation of "Fake" Joho academic papers have a huge impact on Jubilee votes at the Coast." says Mutahi Ngunyi. People took to the Social media claiming that leadership is not all about papers but inborn and God talent. People from social media claimed that there are people who have soo many papers but still reason like they never went to school. According to thoughts by Kenyans, it is also allegedly that even the president did not attend Kenyan schools or he never went but the former president and his father took teachers to Statehouse. All sorts of opinions were taken to social media over Joho 'Fake' papers. 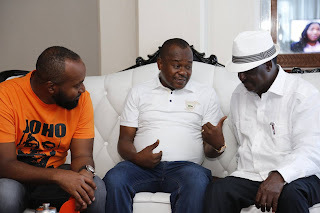 Now there is a lot of propaganda following the fight between Joho and the President. The political analysts said that the IEBC is out of their mandate saying that they are responsible for hosting free and fair elections. "The work of who to contest and personality is none of their business. President Moi was a primary school teacher with a P1 certificate and he ruled this country for 24 years. Now we have governors and senators who are learned (PHDs and Masters) and failed to rule a county for 5 years. So leadership is God-given, not personal effort." Said Kenyatta University Prof George Makhoha. The massive support that the Governor has in Mombasa is what is ailing Jubilee. According to the Political analyst Mutahi Ngunyi famously known as "tyranny of Numbers", the president advisors are doing it worse. "By frustrating Governor Joho in Mombasa or his political backyard shows that the jubilee is desperate and the natives will vote for their son because of sympathy. Again, if the president wanted to build a dry port in Naivasha and backfired he was to look for an alternative because people see him as forcing the project and this action creates a negative perception to the President especial to the people of Coast region" Says Ngunyi.